Who should use Plexus Accelerator+? companion product, Plexus Slim. This product is not to be used in conjunction with Plexus Boost. Best time to take In the morning, take up to 2 capsules. Organic Sweeteners Only No sweeteners added. Why is Plexus Accelerator not meant for long-term use? What is considered "long-term use?" This time can vary from person to person. Plexus advises everyone to check with their physician on how long it's acceptable to take the product. Why can't Plexus Boost and Plexus Accelerator+ be taken together? Plexus Boost and Plexus Accelerator+ were not formulated to be taken together. Each product is designed to work on its own and in a full dose. If you take them together, you risk not getting enough of an ingredient or getting too much of another. They're both thermogenics and best when taken separately, along with Slim. Are the Plexus Accelerator+ bans still in affect in AU, NZ and CA? If not, when were the bans lifted? No. Our current Plexus Accelerator+ is not banned in any country. It was the original Accelerator (which has since been reformulated) that wasn't accepted in Australia. We recommend that if you alternate between the Plexus Accelerator+ and the Plexus Boost, you do so on a monthly basis. Is Plexus Accelerator+ a thermogenic? The Plexus Accelerator+ uses a vegetable capsule (hypromellose) made from parts of a tree. 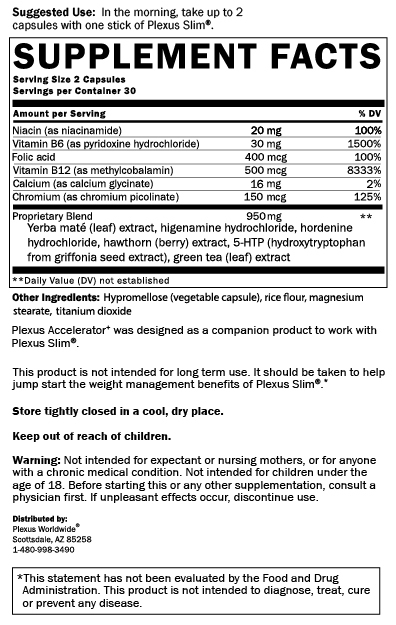 Does Plexus Accelerator+ contain DMAA? The original Accelerator contained an ingredient called Gerana X (DMAA) – once we found out that this ingredient was not going to be allowed, we proactively reformulated the product to Plexus Accelerator+. Our new Plexus Accelerator+ is allowed and none of our products contain DMAA (Dimethyamylamine). The new Plexus Accelerator+ came out in October of 2013. What type of rice flour is used in Plexus Accelerator+? The rice flour in Plexus Accelerator+ is made from white rice. How much caffeine is in Accelerator? The yerba maté and green tea extract contribute 20-25mg of caffeine (roughly the amount found in half a can of soda). However, the effects of Accelerator are primarily from non-caffeine sources. Yes, Accelerator+ is safe. Plexus meets or exceeds all regulatory standards and guidelines for product safety and efficacy.